His character's signature tie, in the movie in theaters now, was made by Lisa Eaton of Kennebunk, where some of the original 1995 film was shot. Bow tie maker Lisa Eaton of Kennebunk couldn’t ask for better product placement: around the neck of a star in a Hollywood blockbuster. 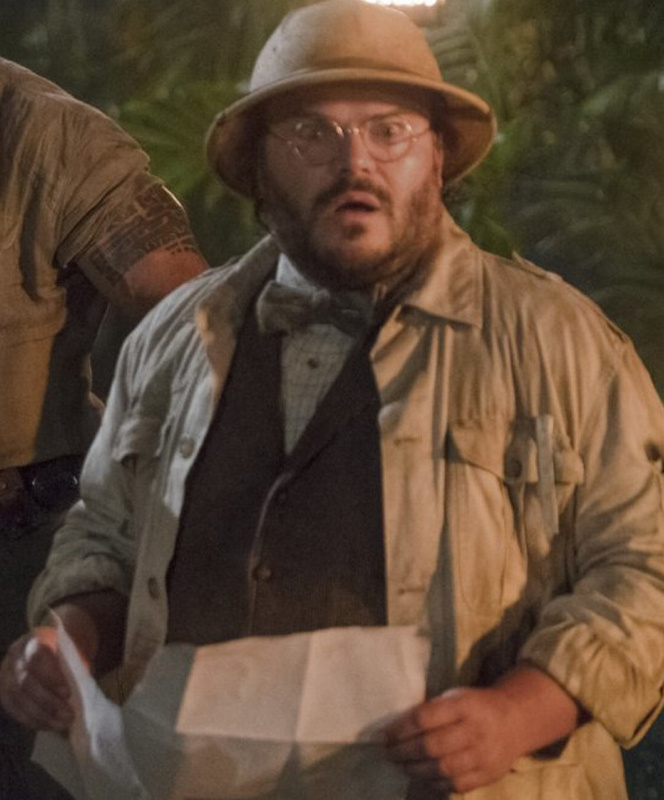 Eaton, who has been making bow ties by hand for more than 20 years, crafted the peacock-striped one that Jack Black sports throughout the new film “Jumanji: Welcome to the Jungle.” The film opened Dec. 20 and has earned more than $208 million, with Black playing a teenage girl trapped inside the body of nattily-clad male cartographer. The film’s costume department didn’t identify the film when it first contacted Eaton more than a year ago, so she assumed it was a student film or at least something very low-budget. She had several email exchanges with the costumers and, at one point, was told that the director needed to see how it looked “on Jack” before deciding if it would fit the film. She was flabbergasted to find out that it would indeed be Black who would help her bow ties make their big-screen debut and possibly launch her as bow tie maker to the stars. But short of decorating the necks of Brad Pitt, George Clooney or some other Hollywood hunk, Eaton will be happy if the film brings more eyeballs to her hand-made bow ties and neckties at bowtie.com. She has about 400 styles for sale, including ones adorned with fishing flies, lobster buoys and sea glass. There are ones with the Maine state flag, jelly beans, the periodic table of elements and a wide variety of colors and patterns. She also makes custom map ties, so people can chart the special places in their lives on bow tie, like where they met their sweetie. Prices range from $34 to $119. And if you want the same snazzy bit of neck decor as Black, it’s available on bowtie.com for $87. The fabric is organic cotton sateen, with a green and brown peacock-feather print ornamented by bright teal stripes. It’s got what Eaton calls the “classic” bow tie shape, about 2-and-a-half inches tall from chin to chest. But you need to have some bow tie-tying skills; it’s no clip-on. Though Eaton designs many of her bow ties and makes them all on two sewing machines in her Kennebunk home studio, the one in “Jumanji” was designed by Blake Perry. The director of research at the University of Arkansas College of Medicine, Perry began designing a line of ties for Eaton about four years ago. He had bought a tie, was impressed with the workmanship and asked Eaton to make him one with the likeness of artist Frida Kahlo. He’s been having Eaton produce his designs ever since and sells them on her website. Lisa Eaton of Kennebunk, who has been making bow ties by hand for more than 20 years, created the tie worn by Jack Black in the new flick. “I haven’t seen the movie yet, but I know I love the tie,” said Perry, in an email. Eaton hasn’t gotten around to seeing the movie yet, either. That might be because she saw the tie a lot while making it. She made 24 separate bow ties, each one with the patterns and stripes falling in the exact same place, and each one with the same exact “limited edition” number. The costumers for “Jumanji” wanted to be sure they’d have plenty for costume changes, or if one or two got lost. The film’s costumers found Eaton’s ties through the online marketplace Etsy. A search there reveals 188,786 results for bow ties. The costumers then went to Eaton’s website. They considered three other prints first, and Eaton made three versions of each so they could be perused in person. Eventually, they settled on the peacock tie. The movie is a remake, of sorts, of the 1995 film “Jumanji” starring Robin Williams and filmed partly in North Berwick and Kennebunk. In that film, youngsters play a mysterious board game, which traps some inside of it and unleashes beasts and mayhem upon the rest of the world. The new version is about teens in school detention who find themselves trapped in a video game and have to play their way through it. Each teen becomes the character they selected to play the game, with popular girl Bethany becoming Professor Shelly Oberon, played by Black. Besides the bow tie, his costume includes a beard, vest and pith helmet. The comic action adventure also stars former pro wrestler Dwayne Johnson, comedian Kevin Hart and former “Doctor Who” co-star Karen Gillan. 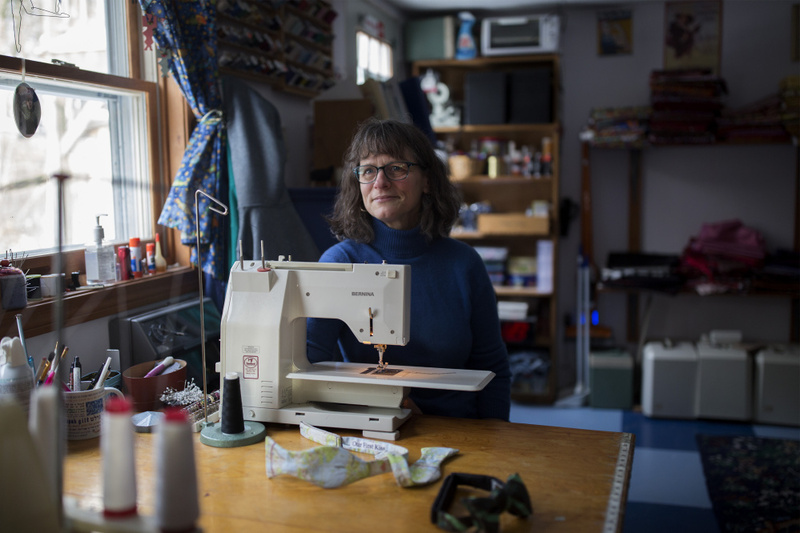 Lisa Eaton makes her bow ties on two sewing machines at her home studio in Kennebunk. The costume department for the new “Jumanji” film contacted her without indicating that it was a Hollywood production; Eaton assumed it was a student project. Eaton started making ties, neckties first, around 1994, while she was still teaching home economics at Noble High School in North Berwick. She had always been a devotee of craft fairs and, at one point, lamented that she couldn’t find better gifts at them, specifically for the men in her life, including her husband, brothers and step-sons. She had made some neckties for her husband, including one with a bowling ball and pins on it, and decided to sell some at craft fairs. After making $1,200 at one fair, she decided to start a business, which became her full-time job in 1998. She doesn’t want to say what her sales figures are, but she says she makes enough to pay her mortgage and health insurance. Her husband is a retired physics teacher. She’s sold ties to celebrities and TV personalities before, including one that was given to Larry King and another worn by Charles Osgood on CBS’ “Sunday Morning.” The late Illinois Sen. Paul Simon owned some of her ties. But she’s never had a bow tie in a major film before, as far as she knows. She says no matter where her bow ties show up – at a prom, a wedding, the office, a baseball game – she’s proud of each and every one of them.